Lilly: Do you make an effort to be obnoxious, or is it a gift? Director Wolfgang Petersen has made some of my favorite movies. He���s had success in many different genres: sci-fi (Enemy Mine), fantasy (The Neverending Story), action (Air Force One), and the medical thriller (Outbreak). 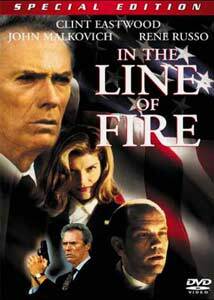 My favorite of his, however, is his 1993 hit, In the Line of Fire. Of course, until this review I had only seen it once, late at night, on HBO (at a cheap hotel). Still, the film always stuck with me, and I was very happy to hear that Columbia TriStar was planning to rerelease the movie as a special edition DVD. Frank Horrigan (Clint Eastwood) is a living legend���the only Secret Service agent ever to lose a president. Horrigan hasn���t been the same since that day, in 1963, when he wasn���t able to save John F. Kennedy. The memory haunts him, and he has battled alcoholism and self-doubt ever since. Thirty years after Dallas, Horrigan is given a chance to correct his mistakes when he discovers a new plot to assassinate the president. A man calling himself Booth (Malkovich) has started calling Horrigan, taunting him with his failure to protect Kennedy and revealing his plans for the current president. Horrigan must fight the system and his superiors, because he is the one man who can...yadda yadda yadda... so the president doesn���t die. Typical thriller fare. What raises the plot above the norm is the screenplay, from writer Jeff Maguire. The characters are very nicely developed for an action film. Horrigan���s guilt is not dealt with as a simple plot point; it is the core of his character. His desperation and his flaws make him instantly likeable. The villain, Booth, is a bit less developed, but I think the focus serves the film well. We see just enough of him to understand his motives and his drives, but not so much that he loses his air of mystery and menace. As Frank Horrigan, Clint Eastwood gives one of the best performances of his career. He deftly handles the humorous, crotchety old man aspects of his character (sending up some of his tough guy Western roles at the same time), but balances this perfectly with the more emotional side. His every action seems to stem from his feelings of inadequacy. He has a heartfelt speech about his experiences with Kennedy that is the best thing I���ve seen him do onscreen. John Malkovich is even better. He has always been a great actor, but here he creates a villain almost on the order of Hannibal Lecter. His cold, calculating speech patterns, his momentary flashes of anger���Malkovich really captures a man on the edge of his sanity. He earned an Oscar® nomination for his work. A lot of the film���s success comes from the interaction between these two great actors, which is all the more surprising considering that they share only one scene. The rest of the time, their conversations occur over the phone. The supporting cast is uniformly excellent, with many standouts including Rene Russo as Frank���s love interest and fellow agent (but don���t make me watch those icky love scenes again�Ķ talk about May/December�Ķ this is January/December). Also present are John Mahoney (Frasier) and Dylan McDermott (The Practice). Wolfgang Petersen proves here that he is, to use a cliché, ���a master of suspense.��� The pace starts strong and only speeds up, with just a few moments of slower, character interaction. Booth keeps popping up to terrorize and manipulate Horrigan, all the while plotting his assassination attempt, and Petersen handles the shifting scenes of detective work, action, and confrontation with a practiced ease. I actually have trouble believing that the man who made this nearly perfect thriller also made the schmaltzy, overdone The Perfect Storm. Now, I have to go downstairs and finish constructing my little plastic gun. Oh, and props to me for not using the phrase ���cat and mouse game��� in this review. Image Transfer Review: Columbia Tri-Star certainly knows how to deliver a clean transfer. This image looks simply wonderful. Colors look bright and full and accentuate the stylistic cinematography very well. Black level is good, with rich, deep shadows and blacks. I noticed no edge-enhancement or digital artifacting, and just a bit of aliasing in some of the brighter scenes. Flesh tones were a bit of a problem���they tended to look a bit orange, especially in shot occurring indoors. The print used for the master was pretty clean as well, with just a few specks showing near the end of the film. Audio Transfer Review: This is a fairly dynamic track. The front soundstage is very wide, creating a fully enveloping sound. Dialogue is always understandable with no audible hiss. Sound effects and score fill out the front soundstage, and there are almost constant directional and panning effects. The surrounds mostly carry the score, but during some scenes they kick in rather aggressively. For example, during Frank���s fainting scenes, when the room spins around him, the audio spins around the room. Nifty! I was surprised, however, by a noticeable lack of bass. I can���t say I felt the sub kick in more than once (during a storm). Still, overall, this track showcases the benefits of a 5.1 setup at home. Oh, and I must commend CTS for including multiple language tracks. This disc supports 4 languages over 6 audio tracks! Perhaps I didn���t miss an in-depth documentary on the film because of the excellent commentary track. Wolfgang Petersen has done tracks for almost all his films, and he seems to have perfected the art. Joining him is J.M. Kenny, who produced the DVD. Throughout the track, Petersen keeps up an engaging, informative, and often humorous narrative. Occasionally Kenny will ask questions or offer comments, but the track definitely belongs to Petersen. There are some very amusing anecdotes offered on working with Eastwood, as well as a lot of technical stuff on the special effects. Definitely worth a listen for fans of the film. Two other substantial extras are brief featurettes, How Did They Do That? and Catching the Counterfeiters. The first covers some of the special effects in the film, specifically the insert shots that plugged Clint Eastwood into footage of Kennedy and the assassination. This was pre-Forrest Gump, and the technology was really in its infancy at the time. The five-minute piece is an interesting look at the process. The other featurette is my favorite extra on the disc. It reveals a lesser-known side of the Secret Service���catching counterfeiters. A SS agent points out all the security features built in to the redesigned U.S currency, and I bet there is at least one you didn���t know about. Five deleted scenes are included, in widescreen but of only fair quality. As with most deleted scenes, these were clearly cut for a reason. The first in particular is out of place (watch for the extreme overacting by a bar patron). Rounding out the disc are the usual items: talent files, production notes, trailers for this film as well as Air Force One and Das Boot, and 11 tedious TV spots. It���s odd that Wolfgang Petersen, a foreigner, has made two of the most patriotic film in recent memory, In the Line of Fire and Air Force One. Both were a lot of flag-waving fun, but In the Line of Fire is clearly the better of the two. The script is taut and suspenseful, Clint Eastwood is excellent, and John Malkovich gives one of his best performances. It stands as one of the best thrillers of the 1990s. This isn���t the first time the movie has been available on DVD, but this new release definitely offers enough bonus materials to warrant an upgrade from the bare bones edition.